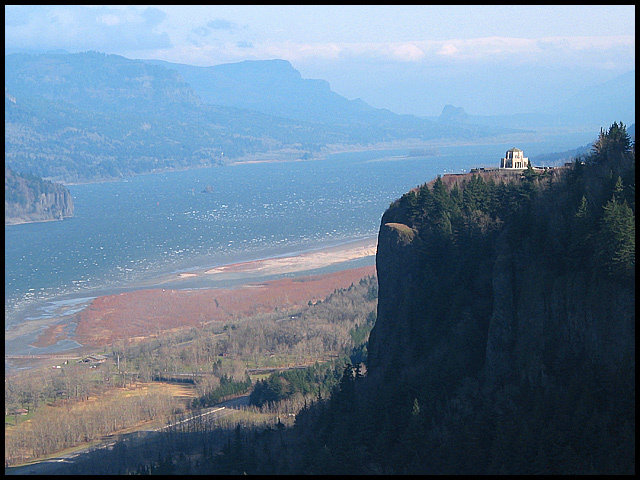 Crown Point overlooking the Columbia River, just outside of Portland OR. Thanks for the CC review Manic. Very much appreciate the time you took to do this throrough review! Yes, I agree, diferent lighting would have really helped this shot. Unfortunately I dont have the chance to get out too often, and I hit this in the late afternoon. Definitely agree that having some lighting on the forground cliff would have helped a lot. As for the post-processing. Yes, I played with the levels and saturation extensively before deciding upon the final product. It was a very hazy day that afternoon, and what you see here is about as good as I could get it withough creating some very unrealistic blueing effects throughout the entire photo. Wish I had a UV filter. Thanks again, and keep tose great reviews coming! The most striking thing about this photo is the contrast between the area in shadow and the rest of the landscape. This makes the foreground on the right really pop out, thus drawing attention to the building on top of this outcrop - great choice of focal point, by the way. The lines of the shot lead the eye across the frame nicely, but I'd be interested to see if it was possible to take this shot from higher up (so that more of the river is in view), or slightly lower down (so that the foreground outcrop covers the background river & hills). The background is an integral part of this landscape shot, so much is covered above. However, I can add that the sky (and the distant hills) are getting a bit grainy, even with as low an ISO as 50, so perhaps a slightly longer exposure with a narrower aperture would help avoid that, but that really depends on your camera as much as anything. Both the focus and the DoF are good on this shot. As for the lighting, as many other people suggested in their comments, it may have been worth going up there at a different time of day (if possible), to get the light coming at a different angle. Since you've not provided any details, I can only guess as to what post processing you've done, if any. The mane thing about this shot is obviously the balance between the very dark shadows and the very light, even hazy, sunlit areas - perhaps some (more) levels adjustments would help cool the lit areas, without losing the details in the shadows... but this might not be possible, of course, in which case this is probably the best compromise. I personally think that this shot absolutely meets the "landscape" challenge, and is an impressive vista, held together nicely by the focal point of the building. Definitely an above-average shot, just short of being great. If you have any questions about this critique, please feel free to contact me via the PM system. This is a nice image the only thing that I'm sure you've already heard is to maybe wait until your foreground would be lit. I know this is hard but it is a huge payoff. Nice photo. Very pretty view, and nicely captured too. Wow! What a viewpoint it is!!! Just wonderful! Unfortunately there isn't enough detail in the shaded part and the highlighted part could use a filter to clarify a bit. I still like it, but would score higher with those details fixed. It is a very beautiful scene. Wow, what an awesome view! I really like the building on the point. The lighting works great too. I wish it wasn't quite so hazy but don't think you have much control over that. Wow. That certainly is a good viewpoint. If I had to pick one flaw it would be that the area on the right of frame is in shadow, maybe you have tried this again at a different time of day. Congratulations on a very striking photograph. oh my, this is the best one i've seen so far. everything is present in this picture, except possible, a time of day where the light is more dramatic. Pity you couldn't get there at a time of day when there was sun on the back of the mountain on the right too. Easier said than done though! The river (?) looks interesting with those whites in it, nice background with hills in a haze. The composition is pretty strong with the use of the building at the right. It draws the eye away from the road beneath and holds the view on the middle and upper part of the image. It needs the road part of the river valley beneath, because it creates the sense of standing on an edge. Good focus, sharpness and esposure. I bet this is extra impressive in summer and fall. It's a very lovely view. I'm glad that the house isn't in the fog too. I think it's good how the cliff is in shadow, it kind of creates a balance with the white fog. The fog mutes the colors, but I like it that way. Lovely angle and framing/cropping. I think I have seen photos of this before, but there seemed to be extra brush or something in the forgroud. Anyway, nice shot. Good luck in the challenge. Looks like a post card shot. I wish the building was larger. Improvements: Maybe a haze or UV filter whould help eliminate the blue haze making the background more visible. Amazing. Can you imagine living there. Your own little mountain. What a view. Very well done. Really meets the challenge. Focus and lighting are good. Subject matter is outstanding. 8 waltoml. Very nice scenic view, must have been a pretty hazy day! I struggle on this shot for a few reasons, the shadow on the ground which could be cropped with no lasting impact to the effect and that my attention is drawn between the landscape and the building on the outcropping. Either would be fine in my opinion, but both is a little much to my eyes. Playing around with the crop on either side would accomplish this. I hope you understand what I am getting at, the shot is still really good.7. Very nice. I wish we could see more detail. Good luck! Nice photo. It looks like it was a little hazy when you took the photo, and the shadows on the ground are a shame - although with the time constraints of the challenge these issues can be understood. You composition is nice, the border is nice and simple, and the focus is quite good. Well done. Columbia River...Maryville? Very cool shot. Good job.......wow o'wow. You did this well. Nice and then some .....good DOF/color, focus. Bravo!!!!!!! Pretty cool. The mountian on the right really give a sense of depth. Wow!! Now that's a view!!! is this the columbia gorge? Great shot. The place looks familiar, where is it? Proudly hosted by Sargasso Networks. Current Server Time: 04/20/2019 02:16:59 AM EDT.